Why Are Community Colleges Being Treated Worst When They’re Needed Most? By the time the police arrived with the pepper spray, sending throngs of college students choking to the ground, it was clear that Santa Monica College’s plan to raise tuition had gone badly awry. Days earlier, the trustees of the 31,000-student community college had announced a novel strategy for dealing with the state of California’s latest round of punishing budget cuts. It would open up new sections of perpetually over-subscribed courses like English and Math—but only to students willing to pay four times the standard price. The college’s mostly-minority, low- and middle-income students saw this as an affront to the institution’s bedrock tradition of affordable higher education. They protested, the cops arrived, the pepper spray was deployed, cell-phone videos of screams and chaos were instantly broadcast, the media descended, and in short order the leadership caved and cancelled the plan. It was, I’m guessing, a bad week for Santa Monica’s president and his board of trustees. But the affair did serve valuable purposes. First, it drew attention to the unconscionable dismantling of California’s once-great system of higher education. More important, it demonstrated exactly what happens when public resources are pulled away. The biggest problem facing many college students is not, as popularly portrayed in the media, the need to borrow tens of thousands of dollars to attend the college of their choice. It’s the problem of not being able to pay for any college at all, because the only college they can attend refuses to have them. 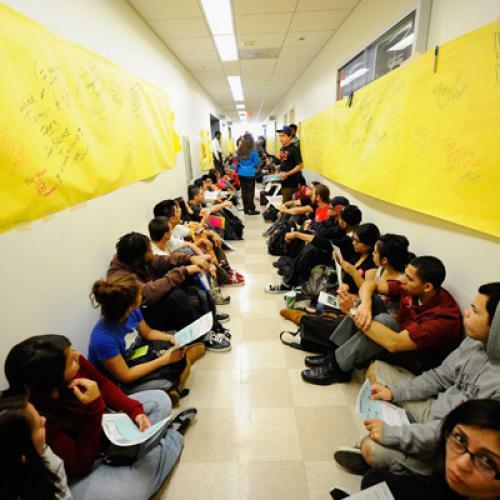 CALIFORNIA’S SYSTEM of organizing higher education is world-famous. Devised by University of California president Clark Kerr in 1960, the California Master Plan split the state’s higher education institutions into three tiers. At the top, University of California campuses would admit the state’s most academically-promising high school students and employ the nation’s most gifted scholars and researchers. In the middle, the California State University system would enroll the next rung of students and train them in fields like accounting and teaching. At the bottom, the California Community College System would provide two years of low-cost education and the chance to transfer to U.C. or CSU. This allowed the state to simultaneously support elite research universities and provide open access to the masses—the two overriding goals of American higher education for the last half-century. In many ways, it was a fantastic success. The U.C. system currently contains seven of the 50 best research universities in the world. And between them, CSU and the community colleges enroll more than three million students. In the decades after the Master Plan was adopted, many other states adopted versions of the California three-tier system. To this day, it is the only way most people know how to think about structuring higher education policy at the state level. Unfortunately, that has masked serious problems with the underlying architecture. It has always been more of a treaty than a plan. In the 1950s, California developed a bad habit of building new universities in whatever district happened to be represented by the most powerful state legislators, instead of where the most students were or would be. And as soon as shovels hit dirt, university leaders began agitating for PhD programs, medical schools, and other accoutrements of elite learning. The Master Plan imposed some order, but the treaty has frayed over time. The CSU and U.C. systems are always fighting for money and prestige. It was also, in California and elsewhere, a system deliberately designed to discriminate against lower-income students. Community colleges are a distinctly American institution that arose to fulfill a particular need. Migration and economic growth ballooned the population of Sun Belt states the middle of the 20th century at the same time that economic and social trends were driving more people to college. Community colleges were a way to meet that need on the cheap. Students would pay less, but so would the government. In round numbers, California currently spends twice as much per student educating U.C. students as it does on CSU students, and twice as much on CSU students compared to those in community colleges. As a result, the original promise was never really fulfilled. Community colleges were charged with doing at least three different things—continuing education for adults, job training for local labor markets, and the first two years of a baccalaureate education—while enrolling students who often came from dysfunctional K-12 schools, all with pennies on the research university dollar. In California, community colleges are governed by locally-elected boards that tend to be heavily influenced by faculty labor unions. This combination has produced some startlingly bad results. While nearly half of all American undergraduates are enrolled in a community college (in California, it’s closer to two-thirds), the majority of them fail to get a degree or transfer to a four-year school. Then came the anti-tax movement and legislation by ballot initiative—two more California innovations—and the subsequent deterioration of state governing institutions. The system was able to kind of, sort of, keep itself together for a while. But after the economic crisis of 2008, the public higher education engine began to seize. IN THE 2008-2009 school year, California’s community colleges enrolled almost three million students. Demand for higher education is traditionally counter-cyclical—as unemployment rises and new job openings dry up, more people go to college for retraining or as a way of riding out the economic downswing. With their focus on access and employment, community colleges in particular are supposed to play this role. But instead of expanding capacity to meet surging demand, California did the opposite by cutting funding to two-year schools. Without enough money to maintain buildings and pay professors, the community colleges cut back course offerings. Technically, anyone could still enroll in the institution. They just couldn’t enroll in the actual classes they need to transfer or earn a degree. Overall enrollment dropped by 400,000 students, which is roughly the size of the entire CSU system, and nearly double the number of undergraduates at U.C. Remember: This in a time when community college enrollment should have been going sharply up. At the same time, CSU began shutting down the two-to-four-year pipeline. Inbound transfers from community colleges dropped by 12,000 students from 2009 to 2010, more than a 20 percent decline. Across the Cal State system, campuses are capping enrollment and reducing the number of courses in which students can enroll. ...there was a [CSU] campus that required a course in the history of world civilization and didn't accept the history of Western civilization, and 60 miles away was another CSU campus that required the history of Western civilization and wouldn't accept the history of world civilization. Scott helped push transfer reform through the legislature in 2010. But this kind of problem is still very common in higher education systems nationwide. One investigation found widely varied transfer standards for a single low-level math course, despite the fact that the analysis was limited to the eleven universities within the City University of New York system. A proposal to fix this problem was denounced by faculty, who saw it as an attack on their academic freedom to reject other universities’ classes as they please. Despite the debilitating dysfunction of the lower-rungs of the public higher education system, the dominant media narrative around the effects budget cuts in California and elsewhere has focused on service reductions and price increases at top-tier places like UC-Berkeley. The Occupy movement, which to its credit brought needed attention to the broad problem of college affordability, was still disproportionately driven by the concerns of middle- and upper-middle class students whose considerable loan burdens were accrued at private colleges and universities. These are legitimate gripes. But in terms of broad impact on social justice and economic competitiveness, they pale beside the hundreds of thousands of anonymous and powerless students who are simply missing from California’s community colleges, and from cash-starved open-access institutions nationwide. THERE ARE TWO ways to think about how to improve this situation (and they aren’t mutually exclusive). The first is to do more with the same amount of money. Online education is unavoidably a part of this conversation. Higher learning via the Internet isn’t for everyone, but it’s for a lot of people, and it is rapidly improving, as broadband access becomes ubiquitous and educators steadily improve their distance education pedagogy. But it won’t come without controversy. Last fall, a move toward expanding public online offerings in California was denounced by the faculty union, on the grounds that online courses would be less expensive and thus require fewer faculty to teach. The head of the union also announced that he was uninterested in any scholarly evidence about the relative quality of online vs. in-person courses, citing the inherently subjective value of higher education. When interest groups slow progress like this, everyone suffers—not least, because students simply go elsewhere. The top destination for California community college students who can’t transfer into the CSU system is the far more expensive University of Phoenix. The second strategy is to do more with more money. California doesn’t have to have (and in the long run, can’t have) governing mechanisms that systematically thwart the public interest. States don’t have to give community colleges that enroll the hardest-to-educate students the least amount of money. Desperate stop-gap measures like the Santa Monica College tuition plan might buy a few extra classes, but they also worsen economic injustice and class divisions that are already deeply embedded in the basic structures of state higher education policy. Opening the doors of higher education to ever more Americans is a perpetually unfinished project. But it’s a tragedy that we are simply choosing to watch some of those doors swing shut. Kevin Carey works for Education Sector, a think tank in Washington, D.C.